In older Thai literature an instrument called the Sa Phon is mentioned. Historians believe this to be the older version of the Thai style drum the Ta Phon. The body of the the drum tapers in at each and forming a bulge in the middle to make a barrel shape. 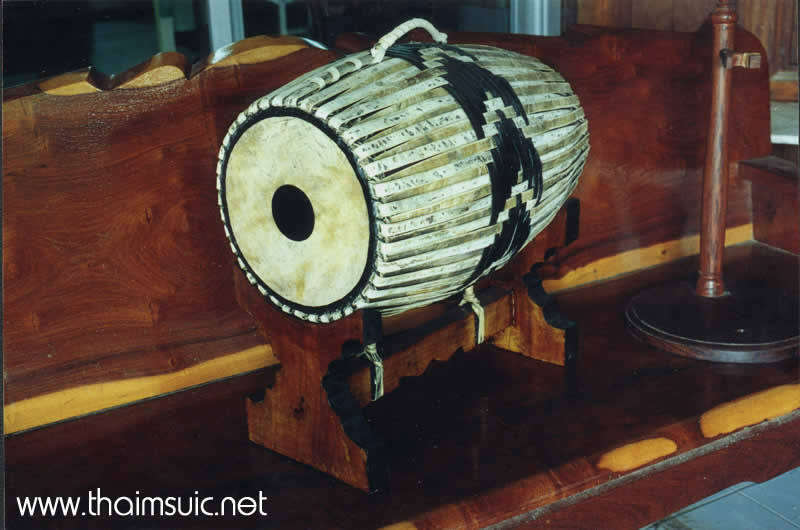 A similar type of drum exists in India and is played with the drum sitting in the players lap with straps going over the shoulders. The Thai version is placed on a stand. ( see picture ) . It is played with both hands using the palms and fingers. The edge of the heads are sewn with twisted strands of cane, then leather strips are pulled through the loops of cane on both ends. Around the center of the drum more strips are woven to form a pattern. This part of the drum is called rat ok . The Ta Phon is a rhythm instrument used in the Pi Phat ensemble.